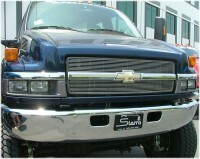 20083: 03-09 Chevy Kodiak C4500/C5500 Billet Grille Insert. This polished 1pc billet grille insert by T-Rex Grilles has an approximate installation time of about 1hr and comes with complete directions and hardware. The factory chrome crossbar (shown) may be re-installed on the grille but is not necessary. Modification of OE factory grille is required. Backed by manufacturers five year warranty. Made in USA. Tell your friends about the Custom Billet Grille Insert (Polished). Share this product on Facebook, Twitter, MySpace or send an email to a friend!